I’d been a bit worried about going to Keighley. The place never seems to end up on any tourist guides and I thought we might have another Leigh on our hands. However the lure of lots of charity shops was too strong and I was quite curious to see this place. I’d deliberately gone to Haworth first as I knew we’d have one good Northern Town under our belts that day. The route from Haworth to Keighley was quite quick as technically Haworth is a suburb of Keighley. Once you get into the centre of Keighley it’s a bit down at heel and could do with a little TLC. We managed to get parked on a side street outside Keighley Playhouse. I love the fact that in most Yorkshire towns they have their own theatres. Keighley is a bit schizophrenic architecturally. On one side you have a hideous 60s Airedale Shopping centre, with faceless retail parks that have sprung up in recent years on the edge of the town with purpose built supermarkets. There is also a modern steel and concrete bus terminus, which doesn’t instil any inspiration apart from to get out of town. If this was the only place you visited in Keighley you would have a dim view of the place. 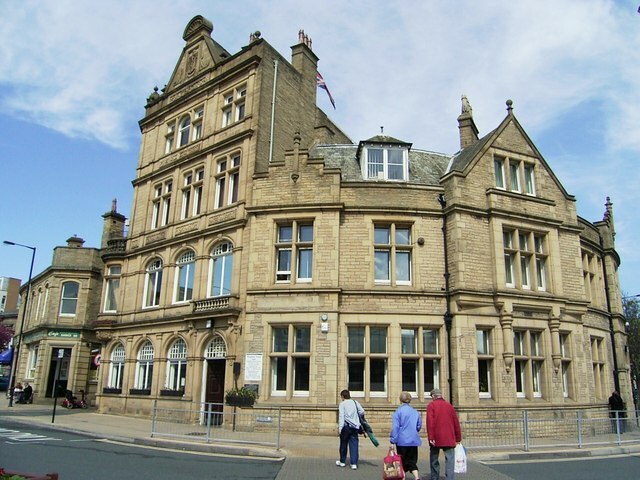 On the flip side, Keighley has some lovely buildings too. The library was gorgeous as it was built from local Yorkshire stone with beautiful carvings that were highlighted in gold. When I spotted it I thought it had the look of a Carnegie Library and sure enough, through the marvel of Wikipedia, I found out it was the first Carnegie library in the UK. On Cavendish Street it had a lovely Victorian building almost running the length of the street. There were shop fronts all the way down with an old style wrought iron canopy covering the pavements. This all looked rather pretty. You do have to look up in Keighley to see what heritage the town possesses. Above a tacky sign of Scoobys Bargain Centre you can see the lovely carved frontage with the word ‘Cycling Club’ standing proud on a solid Victorian building. I just wish the owners of Scoobys would look up and feel embarrassed about the tacky signage they have as it spoils the building they occupy. There was an indoor market in Keighley so we had to explore it. Whilst it wasn’t the most inspiring shopping experience I couldn’t help but be impressed with the care and attention its owners take to keep it clean and tidy and thankfully it didn’t smell of fish. The pensioners were keeping the cafes busy with their Saturday afternoon tea treats. Even one of the empty stalls was transformed into a Halloween grotto of sorts. Sometimes you have to concentrate on the details to make things look so effortless and pristine. Keighley does have a department store called Beales. It’s a chain of sub-Debenhams type department stores which are aimed at the pensioners of the North of England. We were walking down the side of Beales and were overwhelmed by the smell of cannabis. For the life of us we couldn’t work out where it was coming from. I could only think it was from the pub opposite or someone had a cannabis farm nearby. There were lots of charity shops in Keighley, but Neil didn’t find anything musical to buy. I bought two books in Sue Ryder for a pound including the Julie Walters autobiography. Whilst I was queuing to buy them there was a lady in front buying clothes for her kids. She bought a toy and several outfits and it all came to £14. I had forgotten what social services these charities provide to poor mums, especially in hard times like these. I was genuinely touched to see the shop was keen to keep its costs down to ensure the local kids were clothed. Clothes as cheap as 50p and nothing more than £2 - sometimes you would be hard pressed to get an outfit for a child for less than £14 in the likes of Next or Debenhams. God bless charity shops!!! We popped into Morrisons to pick up stuff I’d forgotten to get for tea. I have to admit I get very nosy and when I’m queuing I always try to work out what people are like from their shopping basket. Honestly you can get a good idea of a person from their food choices. In front of us was an Asian lady with her son. I’m quite sad to say I think this lady had an eating disorder. She was very slim and had pronounced features, whilst her son was quite plump, so it wasn’t because they were poor. She was doing that trick where people with eating disorders wear lots of layers and slightly oversized jackets to disguise the fact they are painfully thin. I think she was living off cup-a-soups as she was buying boxes of the stuff. Shopping can be a window on a person’s world and I was quite saddened to see this view. We did need a little more time to explore Keighley, but time was pressing and we had to travel cross country to pick up the M60 to get home. I was pleasantly surprised by Keighley, maybe it had helped that I managed my expectations beforehand. Keighley is definitely the poorer cousin of nearby Halifax, but if you are going to nearby Haworth it’s worth popping to Keighley as long as you skip the Airedale Shopping Centre.